Hardware Camera button versus onscreen Camera button | My Thinking Out Loud! Hardware Camera button versus onscreen Camera button – My Thinking Out Loud! 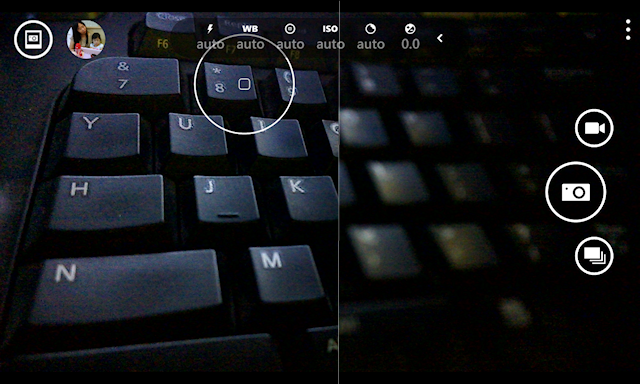 One of the major advantages of a Windows Phone is the camera button at the bottom right edge of the phone. Many people don’t realise the importance of having a hardware button. It’s not about the ability to switch on the phone quickly for the first shot, although that’s an advantage. It’s the ability to shoot quickly in non-ideal situations. Pre-focusing is simply pointing the centre of the aiming reticle at a focusing target at the same distance from you as the target, half-pressing the button to focus, then while still half-pressing, move the entire camera to compose your shot. Finally when you’re satisfied your target is in the correct position, full-press the button to capture. The time to use the onscreen button is when you’re shooting Macro where you’ll need to use Tap-focus for more precise focusing, then tap the onscreen button to capture because the camera will vibrate less when tapping on the screen compared to pressing the hardware button. If you have a tripod, you can even set up the shot, Tap-focus & set the Timer to auto-shoot after 2/5/10s, so there’s no vibration at all!